Chen Wang Ting’s 陳王廷 ancestor, and the first generation of the Chen family, was Chen Bu 陳卜. Chen Bu originally came from Shanxi Province 山西省 before moving to Chang Yang Village常陽常 in Henan Province 河南省. Chen Bu built up his family and helped his neighbours in the village. he was well liked and very respected because he also knew martial arts. After a few generations Chen Bu’s family grew so large that most people in the village have the surname Chen and eventually the village became known as Chenjiagou 陳家溝, which means Chen Village Ditch. This is because the area was slightly lower than the surrounding area and so it was a ditch. Most of the people were farmers, but Chen Bu continued to pass down his martial arts knowledge to his offspring and so is family skill became very good, and this continued all the way up until the 16th generation and Chen Wang Ting. 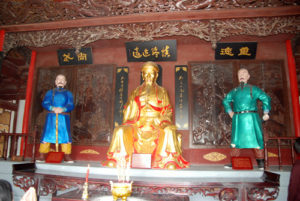 The village became very wealthy and many of the villages worked as officials in the Ming Dynasty明朝, so as Chen Wang Ting, his father and his grandfather. Chen Wang Ting was very intelligent and learnt things very quickly, read many books and had a high level of martial arts skill. Chen Wang Ting’s face had a red complexion and he also had a long beard and looked like the famous general of the Three Kingdoms Period 三國時代, Guan Yu 關羽. Guan Yu was the second brother and so people called Chen Wang Ting Er Ge 二哥, which means Second Brother. What kind of martial art was Chen Wang Ting practicing before he founded Taijiquan? Chen Wang Ting practised his Chen Family Kung Fu, which was passed down by his ancestor Chen Bo 陳卜, and his personal fighting and as well as reading about other styles of Chinese Kung Fu. He put these styles all together.